OXFORD, Miss. 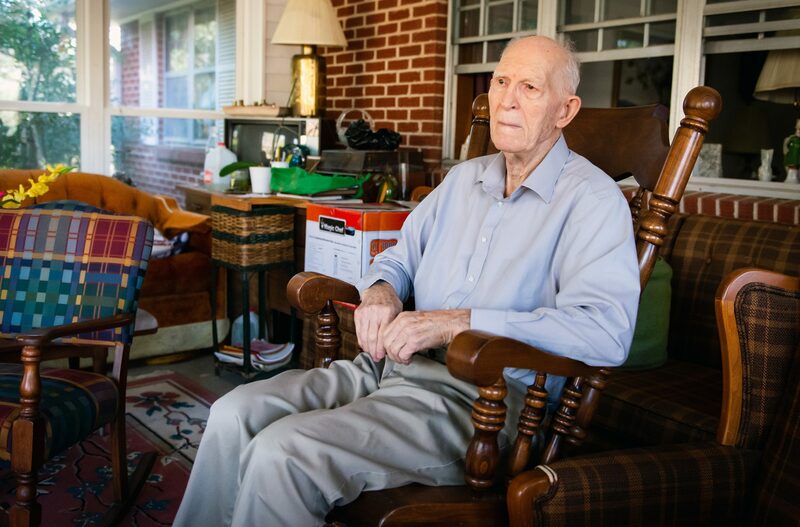 – William D. Longest, who taught biology at the University of Mississippi for more than two decades, has established a scholarship endowment to help offset tuition expenses for students who transfer to UM from a community college. Provost Noel Wilkin said gifts like Longest’s are essential to the university’s growth. Hunter Robertson, an accountancy major from Gore Springs, is the scholarship’s first recipient. The son of a dairy farmer, Longest enrolled at Northwest Mississippi Junior College (now Northwest Mississippi Community College) in 1946 but soon enlisted in the U.S. Air Force. After four years of military service, he continued his education at Baylor University, where he earned undergraduate and graduate degrees in plant physiology. He later received a doctorate in zoology from Louisiana State University. “I got into biology from chemistry,” said Longest, who continues to live in Oxford. “The chemical side of biology is what really interested me at first and it still does. My first piece of research was in plant physiology. After college, Longest taught at Blue Mountain College, Northwest Mississippi Junior College, Memphis State University (now University of Memphis) and Louisiana State University. The major part of his teaching career was devoted to Ole Miss, where he was a biology professor for 24 years. He and his wife of 57 years, the late Catherine Taylor Longest, had no children. But Longest considers many of his students like family. “I’ve got 10 doctors and dentists in town that I had in class,” he said. “One of them is my internist that I go to all the time. Oxford cardiologist Mark Strong, who graduated from Ole Miss in 1991 with a degree in biological science and from the UM School of Medicine in 1996, keeps Longest going. UM alumnus AJ Cochet, Longest’s next-door neighbor, says “Doc” and his wife always treated him like a grandson. “I would hunt with my friends on their property and afterwards, Catherine would fix us a big meal. It was a feast really,” Cochet remembered. “So I really miss her first of all, and I would refer to him as a noble gentleman. From delivering milk for his dad and serving his country to helping his wife care for her invalid brother and for an ailing neighbor, Longest “has lived a life of selflessness with a very strong sense of duty,” Cochet said, adding that the professor was an elder and treasurer at College Hill Presbyterian Church and served on the College Hill Water Association board. Cochet’s children, ages 9, 7 and 3, often visit their neighbor, where they are fascinated by the trinkets he’s collected throughout his lifetime. First preference for the scholarship will go to students from Calhoun County, Longest’s birthplace. To support the Dr. William D. Longest Scholarship Endowment, send a contribution with the endowment’s name written in the check’s memo line, to the University of Mississippi Foundation, 406 University Ave., Oxford, MS 38655. Gifts also can be made online at https://give.olemiss.edu.